When the market plunges, investors immediately begin searching for a new narrative to replace the old one. In Q4, the narrative of solid economic growth and earnings, low inflation, a robust job market and improving wages quickly gave way to one of too much Fed tightening, slowing global growth, escalating trade frictions with China, a strong dollar, stretched valuations and an impending recession. All off this in the course of less than one week. This sudden change in storyline belies the fact that large, open economies – unlike financial markets – simply don’t roll over that quickly. If you read our Q2 and Q3 letters, you know that these two narratives co-existed peacefully, before they didn’t. What changed in October, then, was not so much economic fundamentals as it was a sharp change in market psychology, spurred initially by an off-the-cuff comment by Fed Chair Jerome Powell on October 3rd. Ironically however, that comment may have lasting fundamental implications. For years now, the Federal Reserve has trained markets on the mantra of gradual interest rate policy; raise rates too quickly and risk prematurely ending the expansion and stiffing inflation, too slowly and risk an overheating economy, high inflation and financial market imbalances. A neutral interest rate is simply one that doesn’t stimulate or slow the economy; it’s “just right,” as Janet Yellen once described, alluding to the Goldilocks story. As we entered the fourth quarter, markets were very comfortable with the idea that gradual interest rate policy would prevail and that the economy could chug along in a Goldilocks zone for the foreseeable future. The market had priced in a few more rate hikes before the Fed would pause. That all changed when Powell sat down for an interview with PBS’ Judy Woodruff on October 3rd. After carefully explaining how well the Fed has threaded the needle of monetary policy – not too hot, not too cold – Powell went on to say that the Fed would continue to gradually move toward neutral rates, adding “but we’re a long way from neutral at this point.” In doing so, he seemed to convey a damn-the-torpedoes determination to keep moving forward with rate hikes for the foreseeable future. Goldilocks suddenly became The Little Engine that Could, and markets threw a fit. It’s hard to know why exactly Powell slipped that line in. Our best guess is that he either truly means it (though the data don’t support this), or that he was attempting to defend the Fed’s independence in the face of numerous attacks by the President, who has been critical of the Fed’s march toward higher rates. By emphasizing that the Fed has a way to go before getting to neutral interest rates, he may have been conveying to Trump and the markets that he is firmly in the decision-making seat and that outside political interference will having no influence over Fed policy. Almost taunting the President, he even added “we may go past neutral,” a sentiment that was echoed by other Fed speakers that same week. The problem with this approach is that by suggesting the inevitability of much higher rates, it was the first time in a long time that the Fed seemed to step away from the message that policy would be data dependent. Markets reacted poorly to this unquestionably hawkish turn in policy – whether intentional or not – and within weeks, the Fed began to backpedal. By late November, in the face of plunging equity markets, Powell seemed to completely toss out his earlier message by saying rates are in fact near the bottom edge of the range of neutral estimates among Fed voting members. He added further that the Fed would be “paying very close attention to what incoming economic and financial data are telling us.” The Fed had recanted its hawkish tone and was back on its data-dependent trajectory. In early January, Powell spoke further to the need for the Fed to remain flexible in its thinking throughout this interest rate cycle. It was not hard to lose count of how many times he used “flexible” in his speech. The Fed has now positioned itself to sharply slow the pace of rate hikes this year. In fact, based on market expectations the December rate hike may have been the last one of this cycle. We think that’s unlikely, but it gives a sense of just how strongly the Fed has massaged its message since early October and markets have loved it. Equity markets have stabilized, returning more than 8% since their December lows. Furthermore, by focusing back on fundamentals and flexibility, the old Goldilocks narrative may be back in play, with a chorus of economists and commentators emphasizing that the US economy is fundamentally sound and nowhere near the bleak picture markets were painting of it. More importantly, however, the pause in rates could initiate a period of instability should the Fed have trouble pushing through renewed rate hikes. As in early 1995, the Fed was forced to relent on its interest rate path due to a brewing emerging markets crisis that threatened to spread into developed markets. Mexico was at the heart of that crisis and the US was most immediately at risk of contagion. As the Fed became increasingly worried about inflation in the latter part of 1996, another storm began brewing in the emerging markets, this time in Asia in 1997. Then came Russia in 1998. Each time the Fed relented on its interest rate path, prioritizing immediate market calm over longer-term market stability. Only years after the Fed had become concerned about inflation and “exuberant” equity markets, was it able to begin hiking rates again, staring in early 1999. As we know now, the Fed was far behind the ball of controlling asset prices and inflation and the effects on the economy and equity markets were devastating. The Fed is keenly aware of this mistake, but financial markets have a way of forcing the Fed to choose between its honor and its integrity; should the Fed continue to prioritize placating markets in the short run at the expense of creating longer-term imbalances, there may be hell to pay. Granted, we’re a long way from that, but it’s an awfully slippery slope. Without dismissing too much of what happened in the fourth quarter, we do continue to see a fundamentally strong US economy with just a few areas of concern on the horizon. The labor market is very strong, wage growth is showing signs of picking up and labor market participation is increasing, allowing the economy to grow with minimal signs of inflationary pressure. While the yield curve continues to signal a recession or slowdown 18 months out, we also recognize that may be an imperfect indicator in the age of quantitative easing and that much can change in the intervening time. Global growth, particularly in Europe and China, is beginning to show signs of slowing, while US corporate earnings and the housing market have been spotty in recent months. This is clearly a transitionary economy and an expansion that is long in the tooth, both of which warrant caution. Typical late-cycle characteristics are already present in the data: moderating economic growth, tightening credit conditions, mixed earnings reports, more restrictive monetary policy, and inventory growth (though this last indicator has been forestalled a bit by companies selling inventory down in hopes of getting ahead of new trade tariffs). The next stage, of course, is early recession when, among other things, interest rates are at their highest and borrowers begin having a hard time paying back debt. While we have emphasized the lack of major imbalances in the US economy, we do believe that corporate credit and, to a lesser extent, sovereign debt will be particularly vulnerable in the next downturn. Corporate debt outstanding has increased at twice the rate of GDP growth since 2008 and has been an important contributor to equity market growth (by facilitating mergers and acquisitions, leveraged buyouts and share repurchases). 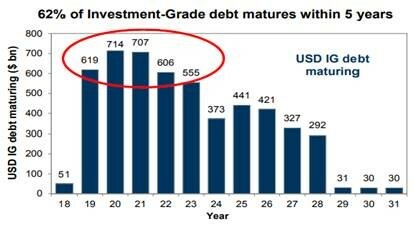 More than 60% of that debt matures within the next five years, which could act as a headwind to future growth. On the sovereign side, US national debt has been increasing at an alarming rate in part due to rising interest costs and the decline in revenue following 2017 tax cuts. In fiscal year 2018 (ending Sept 2018), national debt grew by more than 6% of GDP and is on track to grow by nearly 9% of GDP in 2019. 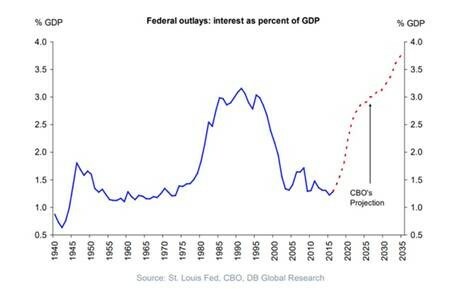 The non-partisan Congressional Budget Office (CBO) projects a sharp deterioration in US debt service in the coming years, without taking into account higher interest rates or a recession during that time. While we don’t expect the US to experience any issues servicing its obligations or financing new deficits, this dynamic could lead to stronger-than-expected upward pressure on yields as buyers demand higher returns for the additional risk. At the moment, there is ample demand for the supply of US paper. In a recession, however, as deficits rise that supply will increase at the same time the Federal Reserve is selling down its own reserve of US bonds. Whether the market can absorb that increase in supply without a sharp increase in yields is anybody’s guess. 2019 is likely to be a volatile year for equities. As bond yields creep up, creating an incentive for investors to trade equity risk for the certainty of fixed income returns, we expect the market to hem and haw between the bliss of economic growth and the terror that it implies for higher interest rates. By the end of the year, we would expect recession anxiety to be in full force. 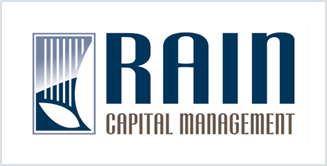 To deal with the equity market volatility, we will continue to build out the Low Correlation Growth parts of portfolios. And, as discussed in out Q2 letter, we will begin adding more traditional, high quality bonds to portfolios. Rather than using the generic Barclays’ Bond Aggregate – which is chock full of corporate credit risk – we will build this exposure using only US Treasury debt across the yield curve.